How To Get Maximum Discount From Ali Express? Ali Express: A company which made its first sale in 2009 is now making more than $30 billion a day during their sales events. At this Chinese e-commerce company, you can find almost anything from a pair of socks to the hat, a memory card to high tech computers, make up kits, home and gardening products, kitchen accessories and much more. There are numerous advantages of shopping online like saving time, effort, price comparisons, and most important saving money. When it comes to Ali Express, all you need to worry is about how to get the maximum discount at Ali Express. You can avail Ali Express coupons by many methods. Ali Express offer different ways to their customers to save as much as they can during their purchase and avail maximum discounts. Here’s how you can save the most out of it. 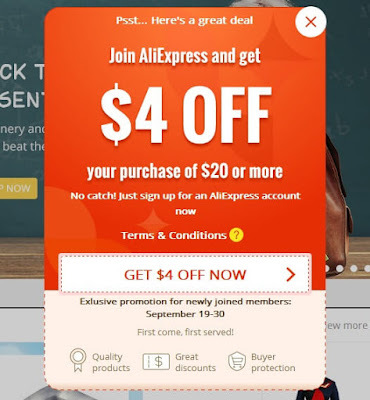 For a new customer, Ali Express offers a coupon of $4 which can be redeemed for the purchase and a user can save money easily. You just have to sign up at Ali Express with your details like name, email and basic information to claim the coupon. Ali Express itself is a marketplace for different brands to enter and sell their products at their desired price. Top brands like Huawei, Asus, Nike, and many more offer coupons separately to the customers who are looking to buy products from these specific stores. These types of coupons are called as store coupons and can be combined with other types of coupons like select coupons. Store coupons can be found at specific store page for eg: Asus Official Store. Select coupons are another type of coupons which are offered by Ali Express and can only be redeemed on those brands/sellers who accept them. Select coupons can be found at Ali Express Sale page and coupon center page. Ali Express mobile application is a revolution for savvy shoppers. Through the app, you can buy with exchanging coins, exchanging coupons and money. Starting with the app, you can avail a discount coupon of $4 when you install a mobile app. The interesting feature in Ali Express application is you can earn coins which can further be exchanged with coupons and help you minimize the bill at most. To collect the coins, there are different methods through which you could be able to earn around 500 coins a day. For the information, one coin can be exchanged with $0.01 approx. -Login daily in the Ali Express app to avail 1 coin at 1st day. 2 coins at 2nd day, 4 coins at 3rd day and the multiplier continue till you keep opening an app and claim the coins. - Using an image search feature of the Ali Express Mobile app lets you earn 2 coins for a single search. - Ever heard of earning money through playing games? Ali Express is here to full fill your dream about it. There are different types of games within Ali Express mobile app like bubble challenge, Lucky Forest, Flip n win through which you can earn coins if you play. Some games are free to play and some require coins to enter the game. - Share a product/category through the mobile app to your Facebook wall to earn a further more coin. You can find more than one seller of the same product at Ali Express, spend some time to find the best seller with the cheapest product of same quality. Some sellers offer free shipping and some don’t, try to find the sellers who are offering it for free. Always look out for interesting sale events which revolve around Ali Express during the year like 11.11 sale event, anniversary sale event, summer event and much more. Abigail Kent is an enthusiastic writer who loves to write on lifestyle, fashion, money saving, and traveling blogs. She holds a bachelor degree in computer science. She loves reading books and making new friends. Say hello to her on Twitter.